The Doctor as ‘establishment figure’ is a complex notion. He’s full of contradictions and there is an initial love-hate relationship with U.N.I.T. as he resists his earthbound conformity. He’s emphasised as a professional (he takes on the official title of Scientific Adviser and is presumably salaried, uses his luncheon vouchers in the staff canteen, goes to conferences at the tax payers expense etc) and is shown in specific professional relationships with colleagues, particularly Liz Shaw, the Cambridge scientist enlisted by U.N.I.T. I think a specific aim here was to move the Doctor’s relationship with his companion away from the paternal to the professional. Liz Shaw breaks the mould of previous companions in Season 7 and is actively portrayed as a professional woman with intelligence, initiative and determination as opposed to the childlike, innocent brother and sister pairing of Jamie and Zoe with the Second Doctor. As a result of the Doctor’s anti-establishment bile and intolerance being directed at him, Brigadier Lethbridge Stewart’s relationship with his Scientific Adviser is at first an uneasy one. This is despite the fact that he must rely on the Brigadier and U.N.I.T as a post-regeneration ‘port in a storm’. The Doctor is now grounded, is no longer at liberty to travel, and the resentment as a result of this enforced conformity is projected onto various figures of authority throughout most of Pertwee’s tenure. He also now functions at the domestic level, as an outsider not only dealing with threats from beyond, and on, the Earth but also negotiating his way through the dying days of colonialism, the all too human obsessions with class, greed, hubris and xenophobia and the industrial-military complex and the petty bureaucracy of government. Clearly, the Ninth Doctor’s recent cry of ‘I don’t do domestic’ is surely a contradiction in terms, as his third incarnation had no alternative but to do that very thing, albeit from a white, male, liberal, middle class point of view. The complexity of this is highlighted in the debates and arguments between the Brigadier, Dr. Lawrence (a suitably paranoid performance from Peter Miles) and the Doctor in Doctor Who And The Silurians. The Brigadier sees the sabotage of the nuclear power centre as a military problem, its Director Dr. Lawrence is more concerned about maintaining the efficacy of the energy project and its/his failure to provide ‘cheap energy’ and how that will affect his career, whilst the Doctor is caught between the two of them, looking for a solution that will appease the bureaucrats and the military alike as well offer an olive branch to the Silurians, the reptile creatures woken from hibernation by the presence of the centre. 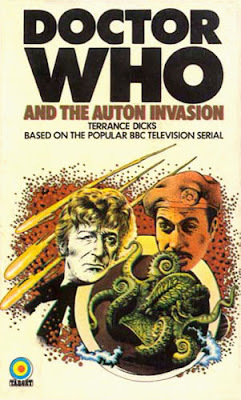 The military and scientific industrial complex is further thrown into relief by the role of politicians in the series with Masters in Silurians, Keith Gold in Inferno and Sir James in Ambassadors representing ‘the white heat’ legislation of the Wilson era as it bashes up against the anti-authoritarian pacifism of the Doctor. Channing, the Nestene in Spearhead From Space and Lawrence are also symbols of corporate management structure whereby Channing performs a takeover of Hibbert’s plastics business and downsizes the company (framed within a typical Bob Holmes double-act) and Lawrence attempts to flatten the line-management structure in order to gain some clarity and rescue his career. Lawrence’s career is so important to him that he’s later convinced that the Silurian plague is a U.N.I.T plot to get him out of his job and he promptly tries to throttle Lethbridge-Stewart. 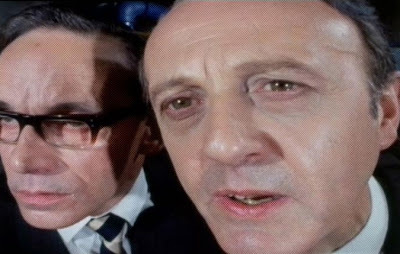 Hibbert and Channing’s symbiosis in Spearhead is the ultimate expression of corporate management takeover and the Auton hive mind spheres seem to suggest the levelling out of hierarchies in managements of the time. 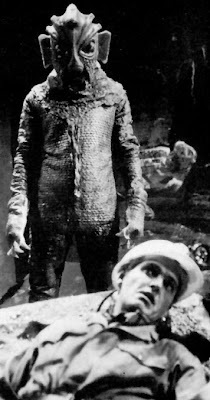 Both Ambassadors and Inferno pick up this theme of ‘industrial’ relations in the various disputes between the Doctor, Cornish, Taltalian and Stahlman. There’s even mention in Spearhead of that bug bear of industrial relations – strikes – just to add to the topicality and the added irony is of course that the production of Spearhead itself was affected by industrial action leading to its all film creation. The power losses at the centre in Silurians also seem to predict the series of power cuts that occurred as a result of poor industrial relations in the early 70s. The moral arguments between U.N.I.T, the Doctor, Lawrence and Miss Dawson are also cleverly echoed by the disagreements between the older and younger Silurians too. The paranoia emerging from Lawrence and his security chief, Major Baker, is reflected in the right-wing aggression of the Young Silurian, his eventual coup and attack on the centre. This of course reaches the bleakest of codas in Silurians where the Brigadier exploits the Doctor’s trust and ignores his pacifist scientific interest in the reptiles. He blows up the Silurian base, much to the Doctor’s utter horror, in a blaze of right-wing militarism that overrules his liberal scientific rationalism. In fact Silurians is a brilliant ‘nutshell’ presentation of the whole series own moral codes and arguments and it provides many moral viewpoints to consider, initially exploring the greyer areas of the military-versus-bureaucracy-versus-scientific pacifism trope where scientists like Dr. Quinn, Miss Dawson, Dr. Taltalian and Professor Stahlman all end up either ambiguously questioning their moral certainty or allowing professional hubris to extinguish them all together. Many of the scientists in Season 7 also sit uncomfortably on the edges of the extreme bigotry, paranoia and xenophobia established in characters such as Major Baker in Silurians, General Carrington in Ambassadors Of Death and Professor Stahlman in Inferno who are arguably on the extreme right of the political spectrum. This aspect of totalitarianism then finds its ultimate expression in the parallel world scenario of Inferno where the warnings of Orwell’s 1984 have become an all too palpable reality and science and militarism appear to be codified as one overwhelming force.